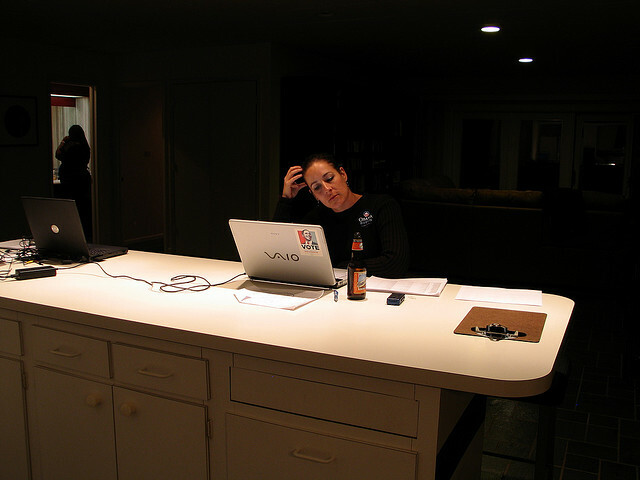 Workaholism: an occupational hazard for web workers? Among the joys of web work is the freedom to create a more porous boundary between your personal and working life. Need to pop out to take your kids to swim lessons in the middle of the day? If you’re a web worker, that’s not a problem. Or conversely, if you have a huge deadline looming, you can say goodnight to your better half and pop open your laptop to get an extra hour of work in. One of the downsides of the digital workplace is addiction to work. Companies are actually facing the opposite problem of the one they thought they’d have, which is that people would essentially not work hard enough. They actually overwork. You’ve seen it all around — people are working on holiday, working in the evening, working at the weekends. People are working much longer hours and seeing this blurring of work-life as being a positive thing, where I actually don’t think it is. I think it’s really important to know when you’re working and to know when you’re not working. If you’re using the same device for work as for talking to your mom, you start to forget which bits are work and which bits are the rest of your life. And actually I think people are becoming addicted to being connected. Web workers are very innovative people and they’re very into new stuff. You can get an activity stream of your friends, your favorite brands and your customers, and everything becomes almost overwhelming. It’ll be interesting how the web worker on the front edge of this is going to evolve to have a true on/off switch — to know that it’s OK not to be watching everything every second of every minute of every day. You can very easily sit online 24 hours a day. As much as you’re willing to consume can be delivered. You can always pick up your phone and you can always see your messages. But you also have the ability to not pick up your phone. What that requires is a level of self-awareness and a level of maturity, for lack of a better word, to know that work is always going to be available to you, but you need to balance fulfilling things in your life than are not related to being online — running or hiking or time with your children or throwing a ball with your dog. Of course, correlation is not causation. So perhaps rather than web work turning people into workaholics, it’s simply that ambitious, workaholic types are more drawn to web-work-style jobs in the first place. What do you you think: Are web workers more likely to struggle with work addiction? Is this because of their basic character or the nature of their workstyle? Absolutely agree; I work remotely, and regularly send and receive emails with colleagues at 10pm, 11pm, 5am… It’s ridiculous (so my husband thinks), but I think once side of it is actually intense job commitment because, though there are many downsides, it’s pretty incredible to be able to work from wherever you happen to be. I feel deeply committed to our company in no small part because I work hundreds of miles from the office, and want to keep it that way. Wow. Why don’t we all party like it’s 1999 again? If you go back and read the big industry rags of the dot.com era you’ll see lots of people talking about the same thing. The great “innovative” work style being promoted by Gist is the same one me and my 1996 web startup colleagues tried to implement way back in the day. Didn’t work for long…all it takes is one person abusing the “flexibility” to screw it up for everyone. Add on the “always on” mentality and you’re headed for big trouble. It’s deja Vu allover again. Sorry, folks. It’s a combination of both. The nature of web work has created a new class of worker that’s independent and often solitary. This doesn’t suit everyone and that’s when it can be like an addiction as noted before. Many of us think that as time goes by the business will develop so that we don’t have to work ALL hours but most are finding it an ever deepening whole as the client base and associated issues grow. Unless you are very skilled at growing your business or have excellent support in admin, outsourcing, etc you will need to be working most hours of the day. I think it’s the nature of their work. It’s much easier to disconnect when you job is largely offline, because you can’t do any work when you’re not at work. Not the same with the web, if you’re online, you can do work, and you probably feel compelled to do work. This is a great post and is something companies, particularly tech type companies, need to think about. While offering fun perks and a more relaxed workplace is great, it is very clear that the work boundary is becoming very blurry for ppl who work on the web. Having a research backround I totally agree that correlation is not causation. Who knows if it’s the industry itself or the ppl attracted to the industry. One could argue that there are workaholics in every field. I think the key difference is that ppl who work in a traditional office can’t take the office home. they can take work home of course but if you work on a computer all day there is a good chance you have computers sitting at home that can access all your work. The thing that is interesting is the cutting yourself off. You say it is a form of maturity but in reality, it’s actually becoming and addiction. I feeling of missing out per say.